On a visit to the Crown Jewels at the Tower of London one of the items you will likely see on display is the Maundy Dish. This dish is used every year at Easter time when H.M. the Queen distributes specially minted Maundy Money to pensioners in recognition of their service to the community and the church. The service takes place at a different Cathedral each year. The presentation takes place on Maundy Thursday, the day before Good Friday and the occasion of The Last Supper, when Jesus washed the feet of his disciples and commanded, or mandated, them to “Love one another.” (Mandatum is where the word Maundy derives). The tradition of the Sovereign giving money to the poor dates from the 13th century. The Sovereign also used to give food and clothing, and even washed the recipients' feet, but the last monarch to do so was James II (r.1685-1688). Special silver coins are minted for the occasion in denominations of 1 penny, 2 pence, 3 pence and 4 pence – and it’s been that way since 1670! The number of people receiving the coins and the amount given is related to the Sovereign’s age: one man and one woman for each year will receive Maundy coins consisting of the same number of pence as the years of the sovereign's age. Her Majesty has distributed Maundy on all but four occasions since coming to the throne in 1952. King Henry IV (r. 1399 – 1413) began the practice of relating the number of recipients to the sovereign's age. When the country went decimal in 1971 the face values of the coins were increased from old pennies to new pence. The Queen’s image on ordinary coins has undergone four changes, but Maundy coins still bear the original image of Her Majesty as issued in 1953 - the year of her coronation. There are two 1661 Altar Dishes which are used to supplement the Maundy Dish; one is decorated with freshwater fish the other with saltwater fish. If the Cathedral is inland the freshwater dish is used – if on the coast then it’s the saltwater dish. Grays was established by Bennie Gray in 1977 in a beautiful 19th century terracotta building in the heart of London's West End. Today there are around 200 dealers selling a wide range of stock including antique jewellery, watches, medals, coins, stamps, antique English furniture and other household items. You can even view one of London’s “lost” rivers – the River Tyburn flows through the basement of Grays Mews. Open: Mon-Fri, 10am-6pm. Tyburn was a village close to the current location of Marble Arch in London. It took its name from the Tyburn Brook which ran through it. The name Tyburn is synonymous with capital punishment, it having been the principal place for the execution of London criminals and convicted traitors, including many religious martyrs. Public executions took place at Tyburn, with the prisoners processed from Newgate Prison in the City of London (where the Central Criminal Court or Old Bailey stands today), via St Giles in the Fields and Oxford Street. In 1571, the Tyburn Tree was erected at the location to facilitate mass executions. The "Tree" gallows consisted of a horizontal wooden triangle supported by three legs. In 1649 24 prisoners were hanged simultaneously having been conveyed to Tyburn in eight carts. The Italian painter Giovanni Antonio Canal, better known as Canaletto (which means “little Canal”) was born in Venice in 1687. His father was a theatre scene painter and Canaletto served his apprenticeship with him before travelling to Rome to develop his art and painting technique. This painting is in the Gemäldegalerie, Berlin. Canaletto returned to Venice in 1719 and made his living by painting grand scenes of Venice like the one above which he sold to wealthy Europeans, particularly the English, who were travelling on The Grand Tour. However, the outbreak of the War of Austrian Succession (1740-1748) meant that the wealthy English stayed away so Canaletto decided to follow his market. 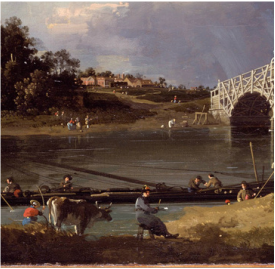 Canaletto spent time in England between 1746 and 1755, mostly in London (the plaque marks where he resided in the Soho district), but at some time after 1750 he travelled out to Walton-on-Thames, Surrey to produce a painting of the new bridge across the River Thames there. It was designed by William Etheridge to consist of "timbers tangent to a circle of 100 feet diameter" and was built so that a single timber could be extracted and repaired without disturbing the rest of the bridge. Old Walton Bridge was completed in August 1750 and acquired some fame, meriting an article in the Gentleman's Magazine, a report in Daniel Defoe's Tour in 1753, and of course the painting by Canaletto. This painting is in the Dulwich Picture Gallery, London. 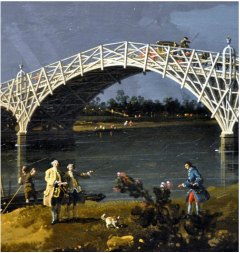 Normally the figures populating Canaletto’s landscapes were anonymous, but his painting of the bridge is unusual because the identities of several of the figures are known. 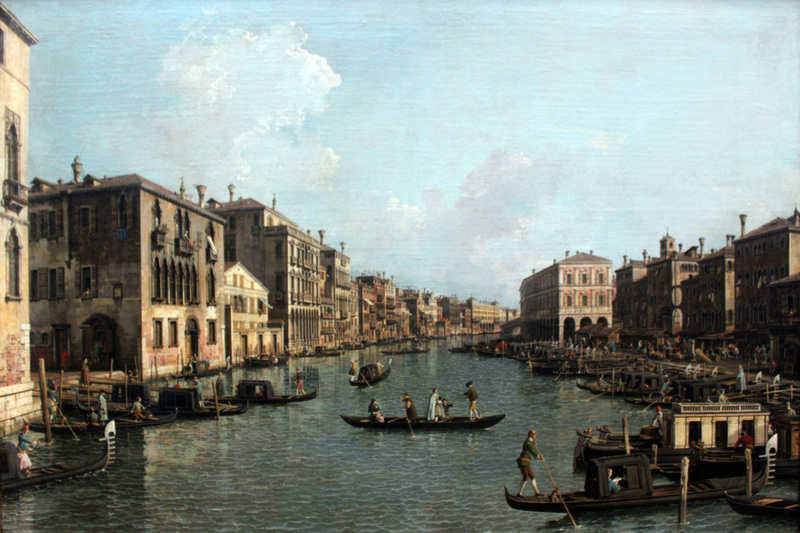 In the centre of the painting, on the near bank, there are two people standing together; on the left is Thomas Hollis who commissioned the painting from Canaletto. On the right is Thomas Brand, Hollis’ friend and heir. Further to the right, dressed in colourful livery, is Hollis' servant, Francesco Giovannini, and at the feet of Hollis is his dog, Malta. Sitting a little distance from the group on the left, with a cow looking over his shoulder, is an artist thought to be Canaletto himself. 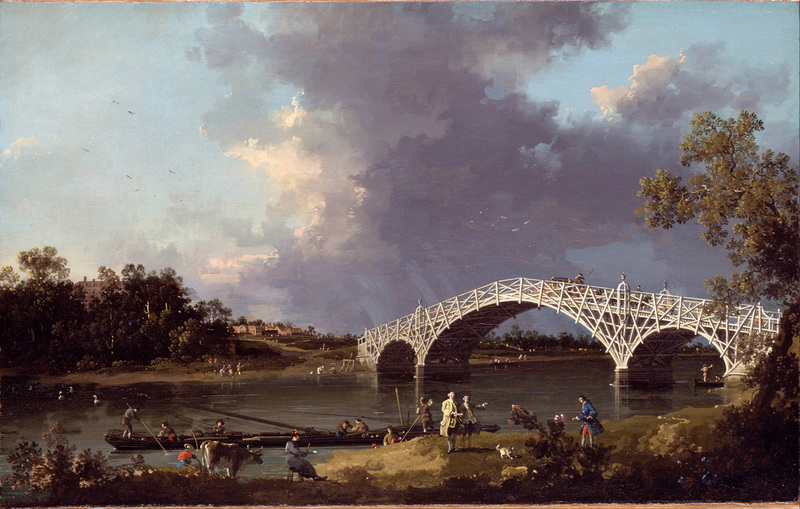 With storm clouds forming above the bridge, Canaletto contrasts the forces of nature with the work of engineering below; the painting is the only of his English works in which he attempts to capture the weather. Samuel Dicker's house at Mount Felix can be seen in the rear of the picture to the left of the bridge, but missing are the extensive stone abutments and brick arches constructed across marshy ground. Dicker commissioned a different view of the bridge from Canaletto in 1755 which shows the full extent of the bridge works for which he had paid. (See below). This painting is in the Yale Centre for British Art, New Haven, U.S.A. If you would like to add a comment to this entry please do so below - thank you. … continuing my trip to Chertsey with a visit to the local museum, although to call it local is to somewhat misrepresent this quite splendid jewel. 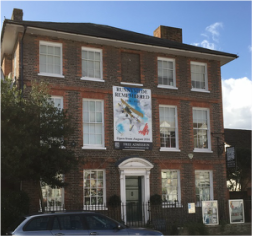 Chertsey Museum is the local authority museum for the whole Borough of Runnymede, which extends to include Addlestone, Egham, Egham Hythe, Chertsey, Thorpe, Virginia Water and Englefield Green; an area of some 30 sq. miles with a population over 80,000. The Borough is within the Thames Valley, the town of Chertsey itself stands on the River Thames, and the collection includes archaeological discoveries from the region of national significance, such as geological specimens, prehistoric bones and antlers; there’s even a Viking sword. The museum is housed in a Regency building known as The Cedars with the displays laid out over three floors – there is an accessible lift for those unable or unwilling to take the stairs. Entry, which is free, is towards the rear of the building where there is a reception desk and small shop. There are various displays and items related to the political, social and economic history of the Borough. The Industrial Revolution, Wars, Transport and the effects they had on town and rural life are all explored with a combination of information boards, artefacts, photographs, interactive computer displays, hands-on exhibits and video screens. Chertsey Abbey features of course, and there are 13th century lead glazed tiles and stone work from the site on display. The first displays the visitor is likely to encounter are those of the Costume Exhibition. Themed around different styles and beautifully presented, the costumes are part of the Olive Matthews Collection of Costume & Accessories loaned by the Olive Matthews Trust which has been supporting the museum since the 1970s. Click the link to find out more about Olive Mathews and the Trust. The 800th Anniversary of Magna Carta and the centenary of the outbreak of the First World War are both commemorated with Temporary Exhibitions. The former runs throughout the whole of 2015 and the latter until August 1st – both are excellent. The First World War exhibition is entitled “Runnymede Remembered” and focusses on the effect the Great War had on the Borough. Exhibits include press cuttings, photographs, posters and paintings. Model aircraft from the period hang as if in flight which, together with a full-size wooden propeller, reference the nearby Lang propeller manufacturing company. There are various munitions on display (including a machine gun! ), a model depicting how the Trenches were laid out, and I was particularly moved by the netting anchored to the ceiling which has been adorned with Poppies: Lest we Forget. Other things to see and explore include various long-case clocks, Greek pottery, material relating to the Chertsey iron foundries, as well as various works of art. For the young, including the young at heart, the museum provides an “Explorers Pack” – a lightweight rucksack containing a museum trail, a magnifying glass, a tape measure and colouring pencils – inspired. Today in 1545 was the birthday of Sir Thomas Bodley, founder of the Bodleian Library, known affectionately as “The Bod”. Thus my thoughts turn to Oxford and the many visits I have done there since becoming a Blue Badge Guide. It is one of my favourite tours and, judging by their complimentary comments, a favourite of my Guests too. Described by the 19th C English poet Mathew Arnold as, “That sweet City with her dreaming spires,” there is certainly much to attract the visitor to Oxford. Famous the world over for the University which has contributed significantly to the life of the Nation for over 800 years, Oxford should be high on anyone’s wish list of places to visit in Great Britain. Oxford University has no campus as such but is comprised of 38 colleges which are independent and self-governing. There are some 20 ancient colleges in the town centre area clustered around the 13th C Church of St Mary. The Colleges are all based around a quadrangle (quad), and all have chapels as they are based on religion. The Colleges are the centre of student life and many of them can be visited by tourists. A Saint! The patron saint of Oxford – St. Frideswide is her name – hear her fascinating story from the 8th C, and it may be possible to visit her recovered shrine. A Cathedral - Oxford boasts the only college chapel in the world which is also a Cathedral – find out why (it has a lot to do with King Henry VIII). The oldest museum in the United Kingdom, itself built on the site of a Royal Palace where King Richard the Lionheart was born (also his brother John – see Magna Carta). The scene where Protestant martyrs were burned at the stake in the 1550s during the reign of the Roman Catholic Queen Mary I (aka Bloody Mary!). The first building by architect Sir Christopher Wren, builder of St. Paul’s Cathedral in London, still used for University ceremonies including bestowing of degrees. See (or visit) the Pub where a group of well-known literary people, who styled themselves ‘The Inklings’, would regularly meet to discuss ideas. The English Civil War – King Charles I made Oxford his headquarters during this turbulent period of English history. Alice in Wonderland (or Through the Looking Glass) - the character was based on a real person. Harry Potter – scenes from some of the movies were filmed in Oxford, and the dining hall at Hogwarts School is a studio mock-up based upon a college hall. The water-meadow at Runnymede near Windsor is the location where, in 1215, King John sealed the Magna Carta or Great Charter. The charter indicates Runnymede by name. The Magna Carta had an impact on common and constitutional law as well as political representation; and also the development of Parliament. Runnymede's association with the ideals of democracy, the limiting of power, equality, and freedom under the law, has resulted in the building of monuments in the location. In 1929 the land was donated to the National Trust by the American-born widow Cara Rogers Broughton in memory of her husband Urban Hanlon Broughton. Sir Edwin Lutyens was commissioned to design a memorial to him consisting of lodges and piers at the west (Windsor) end with kiosks at the east end. Situated in a grassed enclosure on the lower slopes of Cooper's Hill, this memorial is of a domed classical style, containing a pillar of English granite on which is inscribed "To commemorate Magna Carta, symbol of Freedom under Law". The memorial was created by the American Bar Association (ABA) to a design by Sir Edward Maufe, architect of Guildford Cathedral. The memorial was unveiled on 18 July 1957 at a ceremony attended by American and English lawyers. Since 1957 representatives of the ABA have visited and rededicated the Memorial renewing pledges to the Great Charter. The ABA will be meeting at Runnymede this year on the 800th anniversary of the sealing of the original charter. The British memorial to the assassinated President Kennedy (22nd November 1963) was jointly dedicated in May 1965, by Queen Elizabeth II and Jacqueline Kennedy, prior to a reception for the Kennedy family at nearby Windsor Castle. The area of ground on which the memorial is situated was given as a gift to the United States of America by the people of Britain. At the top of Cooper’s Hill is the Air Forces Memorial, also designed by Sir Edward Maufe, which commemorates the men and women of the Allied Air Forces who died during the Second World War. The names of the 20,456 airmen who have no known grave are recorded. Runnymede can be included in a visit to Windsor Castle - contact me for details. Being born and bred in the North West of England I have fond memories of, and a real soft spot for, the Lake District. With a dozen or so of the largest lakes in the country, the highest mountain in England, and nearly 2000 miles of rights of way you can walk, climb, cycle, horse ride, go sailing, rowing, motor-boating, kayaking – you can even walk on water in water-walking ball! To keep the kids entertained there are Adventure Playgrounds, Tree-Top Nets (walkways, slides and tunnels made out of nets), organised workshops, and a whole host of walks and events with the whole family in mind. It’s not all activities though – there are many attractions to visit. If it’s the animal kingdom you’re interested in then there’s an Aquarium, a Wildlife Oasis and a Bird of Prey Centre. Other places to visit include Castles, Museums, Cottages associated with the famous poet Wordsworth as well as the Church where he is buried. For Beatrix Potter fans you can visit her home at Hill Top House - the house, farm, and nearby villages feature in some of her best known books. Why so many Lake District cottages are painted white. A. Houses and farms used to be treated with red lead and then lime-washed, which whitens, to keep out the damp. Many of today’s homeowners have continued this look by painting their houses white. That dogs bark at me as I halt by them;"
The re-interment service will take place at Leicester Cathedral on Thursday 26th March 2015 and will be attended by Their Royal Highnesses the Duke and Duchess of Gloucester and Her Royal Highness the Countess of Wessex. Four days earlier on Sunday March 22nd there will be a procession through the City and County as the Monarch’s remains are taken on a journey that partly follows Richard’s own march to Bosworth Field, scene of the 1485 battle at which he was killed and which ushered in the Tudor Dynasty. The remains of the last Plantagenet King, who reigned from 1483 – 1485, were discovered in 2012 buried beneath a car park in the City of Leicester where once stood a Franciscan Friary – Greyfriars. How much of Medieval History will now have to be re-written? Was he really the evil, murdering tyrant depicted in Shakespeare's play, or a brave warrior, a wise and just ruler denigrated and defamed by Tudor propaganda? We met up outside the South entrance to the Museum, which is in Great Russell Street, where I did a short history of the building and focussed on the statues in the pediment above the main door. The statues represent The Progress of Civilisation with man emerging from a rock as an ignorant being and developing into educated man by expanding knowledge and understanding. The Rosetta Stone was the first item - arguably the most well known and, judging by the numbers of visitors that gather around it daily, one of the most popular. Well justified given its role in finally being able to decipher Egyptian Hieroglyphs after 1400 years! Next we visited Mesopotamia in the 8th & 7th C BC and the 2nd Assyrian Empire. Taking in the gigantic Winged Bulls of Khorsabad, which are amongst the largest and heaviest exhibits in the collection, we arrive at the stunning Lion Hunt Reliefs from the palace at Nineveh. Such fine detail and realism - imagine what they would have looked like when new and brightly painted. The Parthanon Sculptures followed - so Ancient Greece and the Acropolis. The Parthanon, or Temple to the Goddess Athena Parthanos, was built in just 15 years (447-432 BC) and still sets the standard. There are three kinds of sculpture: a low relief frieze depicting scenes from a great procession; the metopes with high relief sculptures of a mythical battle (picture); and full statues from the pediments at each end of the building. Even though these marble sculptures are damaged and/or defaced all agreed they are nonetheless dignified and beautiful. We then travelled to another Continent - the Indus Valley and the discovery of an ancient civilisation of the 3rd Millennium BC about which nothing was known until some tiny seals, probably used for trade, were found. Subsequent archaeological exploration uncovered the remains of entire cities capable of sustaining populations of 30,000 to 35,000 people! Why these cities were abandoned isn't clear, a shift in the course of the river, climatic change or perhaps a natural disaster, but large numbers of people appear to have been on the move. There seems to have followed a cultural merging and mixing of language and beliefs that perhaps gave birth to Hinduism. We looked at artefacts and exhibits representing some of the Hindu Gods, e.g. Shiva, Parvati & Vishnu, and the stories and legends associated with them. Ancient Egypt - Land of the Pharohs, the Pyramids, Tombs and Mummies - was next. A brief look at pre-dynastic burials, the belief in an After-Life and the need to preserve the body; leading to a description of the process of mummification before we looked around the many fascinating items in these galleries. Finally we looked at some Treasure; three Treasures actually, beginning with the unique Mold Gold Cape. Discovered by chance and painstakingly reconstructed, this superbly decorated, breathtakingly thin solid gold adornment which dates from the Bronze Age is witness to the skills and craftsmanship of the people of that age. The Mildenhall Treasure - 56lbs (25kgs) of solid silver tableware dating back to Roman occupied Britain of 4th C AD with a mix of Pagan and Christian symbolism reflecting the changes in belief occurring at the time.